Atlan = In, by, alongside, under water. Ahtlantica=A big stretch of abundant water (A Nahuatl name for the Atlantic Ocean.). Atlantona = Resplendent Lady of Water (Another Nahuatl name for the Atlantic Ocean). Atlantech/Atlantesh = Place under, by, in, alongside water. Atlantes = Nahuatl name for Atlas holding up the world. "The Language of a Mighty People Is the Greatest History." Of all the frequently told myths and legends on earth, the story of ancient Atlantis has never ceased to be popular. Speculation continues, especially as to where it was located. Every place on earth -- even Outer Space-has become a candidate. 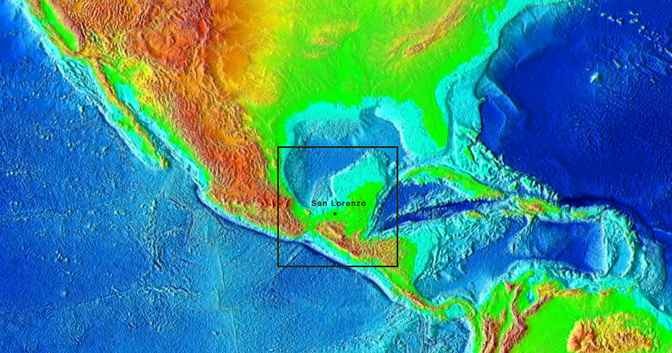 In this article, you'll learn that there was not just one Atlantis in ancient Mexico, but many Atlantises. All of them were and still are in Mexico. But one of them once sank under the waters of the Caribbean Ocean, just off the coast of Southern Veracruz and Yucatan. Which one of all these Atlantises was the real Atlantis? What was its real name? In Timaeus (24), Plato clearly pinpointed the location of the real Atlantis. I'm amazed that everyone would think it did not exist in the Americas. Plato said, "This power came out of the Atlantic Ocean, for in those days the Atlantic was navigable; and there was an island situated in front of the straits which are by you called the Pillars of Heracles; the island was larger than Libya and Asia put together, and was the way to other islands, and from these you might pass to the whole of the opposite continent which surrounded the true ocean; for this sea which is within the Straits of Heracles is only a harbor, having a narrow entrance, but that other is a real sea, and the surrounding land may be most truly called a boundless continent." Libya was the Greek name for the whole of Africa. Both Americas are greater in size than Africa and Asia combined. This "opposite continent" is certainly opposite Africa. Before the eastern part of Mexico became the bottom of what are now at least part of the Gulf of Mexico and the Caribbean sea, the present narrow strip of swamps and the river Chimalapán connecting Southern Veracruz and Oaxaca, the Isthmus of Tehuantepec, was a wide waterway uniting the Gulf of Mexico with the Pacific. About four thousand years ago, sailing vessels could and did easily cross from the east coast of Mexico to the Pacific in a few hours. The Greek historian Seculus said that the Carthaginian Phoenicians possessed a large and rich island on the Atlantic Ocean. It was called Al Atlantis. According to him, the Phoenicians found it accidentally when some of their ships became lost and were carried to the island by the Atlantic currents. He also stated that the Phoenicians kept their trade route to this island a secret. Plutarch (2 AD) wrote that both the Phoenicians and the Greeks had visited this island which was "on the west side of the Atlantic." They even intermarried with the native-American women. From the time of the Spanish conquest, the people of Mexico have dreamed of widening the Chimalapán (Sheemala-PAN) River, reconnecting the two coasts. Panama lies farther to the south of the Isthmus of Tehuantepec. Its name also derives from Sanskrit: Pana-Maha (The Great Crossing). The Sanskrit word "Pani" refers to merchants who traffic in trade goods, going from one place to another. In Nahuatl, Pan or Opan means "traveling from one side or place to another." This word "Pan," which we inherited from the Phoenicians, became part of the respective vocabularies of nearly every nation on earth. Example: Panamerica (all over America); Pandemic (an outbreak or ailment extending all over a certain country or region), etc. The pre-conquest Meso-Americans claimed that their primordial founding city was Tollán or Tula. The ancient Toltec ruins of Tula, Hidalgo, Mexico, on which the Mayan city of Chichén Itzá was modeled, is also Tollán. [RIGHT: The ruins of Tula. ]Turan, Tolan, and Tulan are ancient names of the Turkic peoples who occupied all of Turkey and Central Asia. With their partners, the Ramanakas ( Hindus), they founded every civilization on earth, even those of Egypt and Sumeria, as well as those of all the civilized nations in both Americas. Ancient India, or what we now call the Indian subcontinent, was once sandwiched between two much larger nations. 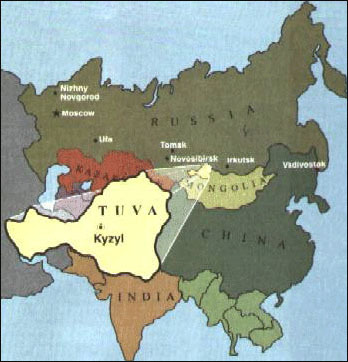 On the North side was Tannu-Tuva, the land of the ancient Turks (Turanians, Tulanians, Krishtayas or Kurus). On the south was a nation larger than both of them: Lanka or Ceylon). At the time of our Noah, a great flood inundated the tiny Turkish region of Tannu-Tuva called Altai, plus other regions of Tannu-Tuva (today's greatly reduced Tannu-Tuva and Khakhassia). This flood forced the Aryans or Kurus to migrate deep into India, uniting themselves with the Ramanaka or Indian people already there, eventually turning the entire Eastern Hemisphere into a single nation called India. Later, with the Hindus called Dravidians (Tamils, Malayam, etc. ), they explored and settled the Americas and every other place, even naming these previously unknown lands. 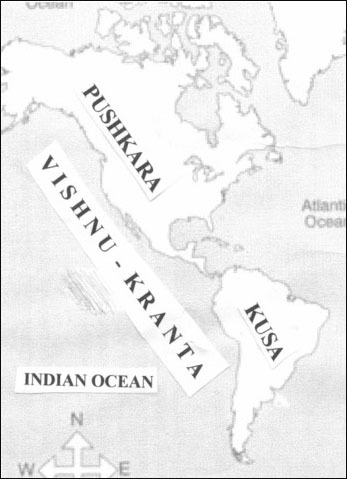 The Hindus called North America Pushkara (Land of Great Lakes, such as those between Canada and the USA). South America was Kusa Dvipa (Land of Fine Grasses-the Argentine and Chilean Pampas Grasslands). Both Americas resembled an eagle's (the Hindu Garuda's) outstretched wings. Therefore, they were called Vishnu Kranta. When the Kubera (Naga) sailing people arrived in the Americas, they also named North America "Quivira" (land of Kubera, Kheevera, or Heber). (See Father Gregorio's El Orígen de Los Indios).